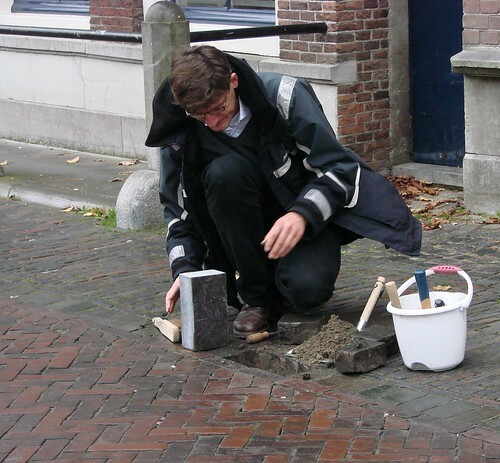 If you walk along the western side of the Oudegracht, around the 300/400 block, you may notice a string of letters along the edge of the street. Look closer and you’ll realize the letters form words and sentences and an ever-growing poem. One letter at a time, one Saturday at a time, the poem grows. As long as there are patrons to purchase a letter, the poem will continue. 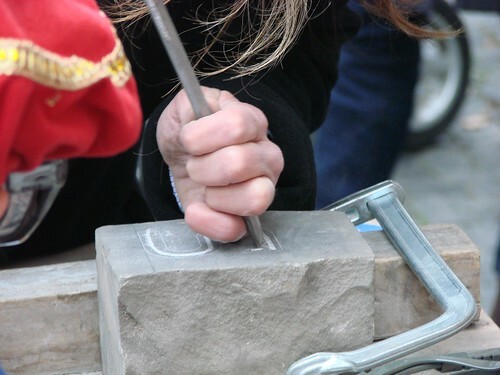 Each Saturday afternoon, around 13:00, you can head to Oudegracht 309 (or thereabouts) and see the latest letter being carved and installed. 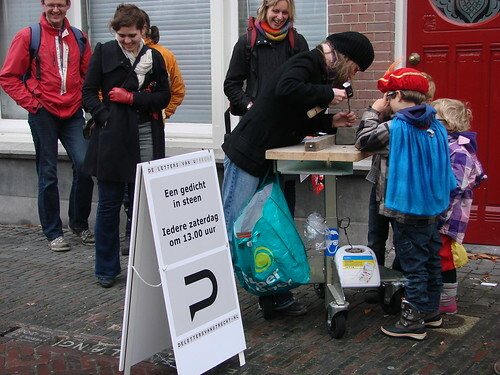 I’ve been meaning to stop by for a while, so since we were in the neighborhood last weekend anyway for Sinterklaas’ arrival, we headed down to see a bit of the latest letter being carved. If you’re looking for a gift that’s a little bit different, yet surprisingly permanent, consider purchasing a letter for someone. They cost around €100, but €10 goes toward a charity and the rest mainly goes for costs. 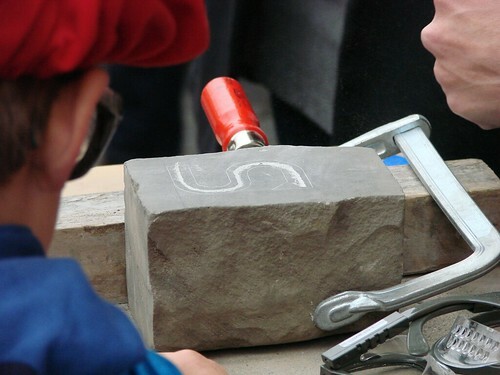 Each stone is also marked with a number so that the recipient/donor can easily tell which is their letter. The sponsor can also have their name or initials carved on the side of the stone, although that won’t be visible once the stone is in place. The project officially began on June 2, 2012, but they retroactively added letters so that the poem officially began January 1, 2000. Seeing a fair chunk of the poem already in place surely makes it more intriguing and appealing and allows potential sponsors to better understand the project. If you’re interested in learning more, there’s an official website in Dutch and English. It also has information on how to sponsor your own letter. When I have a bit of disposable income someday, I’d love to have a letter of my own. It’s a nice way to leave a cultured mark on the city. If you’re in town tomorrow afternoon — or any Saturday — don’t forget to go watch the newest letter being put in place. The S that we saw was the end of a word (langs) so a new word will be starting tomorrow. 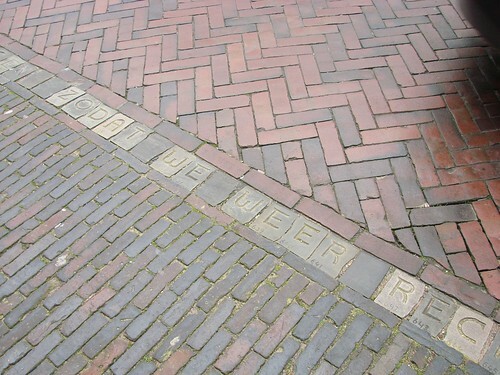 Of course, you can see the poem whenever you want simply by walking down that stretch of the Oudegracht. Last night was the last of the Domtoren carillon summer concerts. To close out the series, carillonneur Malgosia Fiebig, along with pianists Sandra Mol, Jeroen van Veen, and Marcel and Elisabeth Bergmann, performed Mike Oldfield’s classic Tubular Bells. Even if you’re not familiar with Mike Oldfield, you’re probably familiar with the part of Tubular Bells that was used in the horror film classic The Exorcist. The concert, since it’s performed in the Domtoren, is easy to hear throughout much of the city center. Knowing we can hear the Domtoren during its hourly musical interludes, G and I decided to listen to the concert from our back terrace. Unfortunately, we forgot to account for all of the neighbours around us, who were all eating dinner, watering plants, having phone conversations, and generally making the most of the nice weather. Still, we could hear all but the quietest bits and it really was wonderful to hear it played on such an instrument. I didn’t realize at the time, but they had seating set up at the Buurkerkhof so that people who enjoy the concert. In addition, they projected on a wall in the square a video image of the musicians performing. The pianos were amplified using speakers pointing in four directions at a height of 40 meters (the sound you hear comes from the tower and was heard throughout the city!). The performers were playing in a small room at a height of 70 meters. I didn’t get any video, but fortunately, others did. Here’s a link to a short section of the concert, and below is another short version of various sections of the concert. Enjoy! 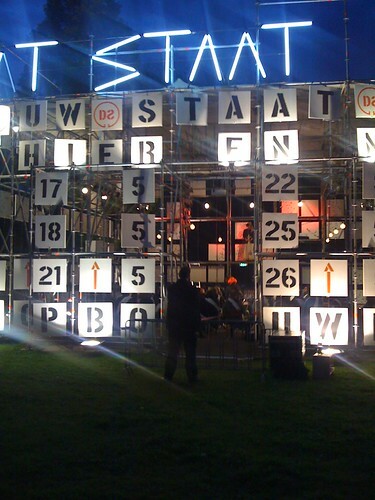 The other evening, G and I decided to walk past the Stadsschouwburg to see the structure that had been going up for the Festival a/d Werf. It was opening night, so we actually got to see the building in use. The program being presented is Dat Staat (That State). As the program explains, it is “a challenging theater project in which actors, audience, and experts — in six days — establish a new state, and perhaps create history”. From what we could see, it does seem to be fairly interactive. The audience was seated in sections and they all seemed to be wearing sashes. I couldn’t hear very well, but it definitely seemed like audience members were being chosen to stand up and interact and perhaps give opinions. It seemed to have a humorous element to it, though, because one of the actors who was calling on audience members seemed to be dressed as Qaddafi. The show took an even more surrealistic turn when “Qaddafi” appeared up on a second level and began playing a keyboard/playing DJ while singing Lionel Ritchie’s infamous song, Hello. 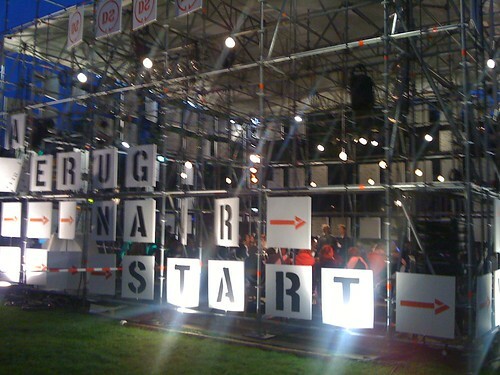 The show seemed to be in a mix of Dutch and English. One of the MCs was speaking in Dutch, but the Qaddafi character was speaking in English during the part that we saw. I didn’t hear which language the audience member responded in when she was called upon. It seems like it might be an interesting program. If you’re in town and interested in seeing it, it runs May 21, 22, 25, and 26, and begins at 20:30. Tickets are €15 online. So yes, I did end up having one my photos from the M31 demonstration used to illustrate an article in duic.nl yesterday. It’s all quite thrilling, somehow, even though it’s not the first time I’ve had a photo credit. Still, I’m more used to bylines than photo credits, so I guess that’s why it’s so nice. Plus, for the topic, it makes me feel like I’m involved in life here in Utrecht, even though I wasn’t actually at the full demonstration. But hey, I did get my coverage of the Occupy Wall Street event here in Utrecht covered/verified by CNN, so I guess my “photojournalist” tag isn’t completely facetious. 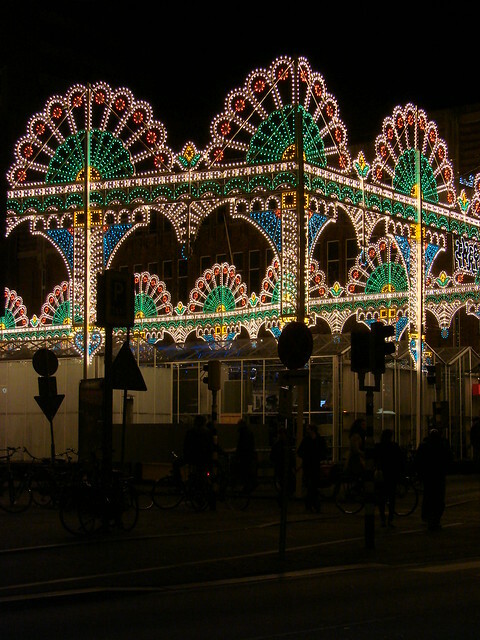 After photographing the peaceful protest, I went out later in the evening and photographed the lights at Neude that were part of the Tweetakt Festival. Inadvertently, I took part in the Earth Hour, since we were gone from the house and had the lights off. On the other hand, I was photographing a fantastical light display, so I’m not sure if it really counts. Balanced out? Anyway, here’s one of the photos I took. I’m sure I’ll be posting more of my favourites when I get a chance. Sadly, Trippist.com closed its suitcase and packed away its passport at the beginning of this year, which meant I no longer was posting about various events going on in and around Utrecht. Still, out of habit, I kept finding events and such that I thought people might be interested in, even if I knew I wasn’t going to be able to go. 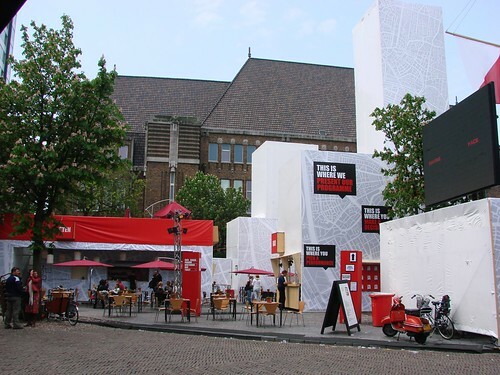 So, I figured I’d create my own calendar of events here in Utrecht for anyone wanting to get out and about and see all of the culture the city has to offer. Of course, I can’t guarantee that it will be the most extensive calendar, but I’ll try to keep it updated as much as possible. If you know of something going on, pass along the info to me and I’ll add it if I think it’s something right for my readers. 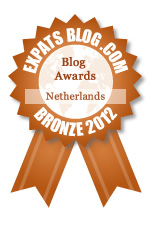 You can find the calendar up at the top of the page, next to the About and Other Expat pages. I hope those of you who are local find it handy. 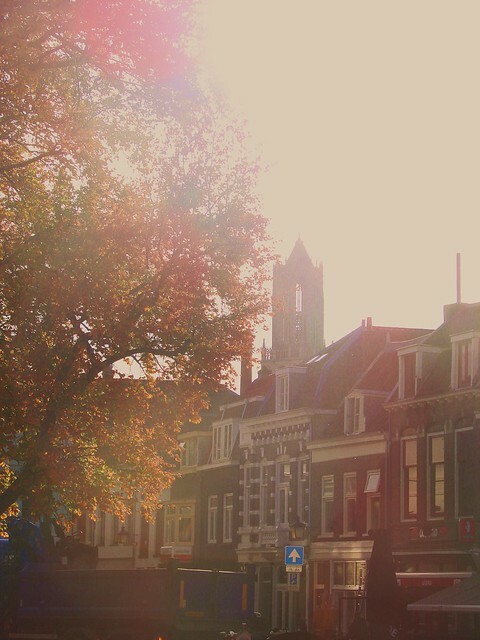 Before heading to the market today, we took a slight detour over to Korte Minrebroederstraat and the Stadhuis. I knew that there were supposed to be various events there today as part of the In Vervoering Festival taking place in Utrecht this weekend. The festival is a mix of music, poetry, theater and film, often mobile, and in unexpected places and formats. You can ride in a bakfiets and have poetry recited for you, for example. The festival continues through tomorrow. More of the action is moving to the nearby Lepelenburg Park tomorrow, so I’ll have to check the schedule and see what else might be worth checking out. What we saw today was a bit like Stomp, but with cups, along with a bit of singing and chasing. It was a fun performance to watch. For once, I thought to use the movie option on my camera and filmed a snippet of the performance. Don’t mind the bikes passing by; that’s just normal life here. If you can’t see the embedded video, click here to go to the youtube page. I came across this video today and wanted to share it. It’s a lovely short promotional film highlighting the beauty, charm, and culture of the city. It all looks so glam! I also thought it might be nice for people to see the city in motion, in a sense, if you haven’t been here before and only know my photos. Some of it might even be familiar now! 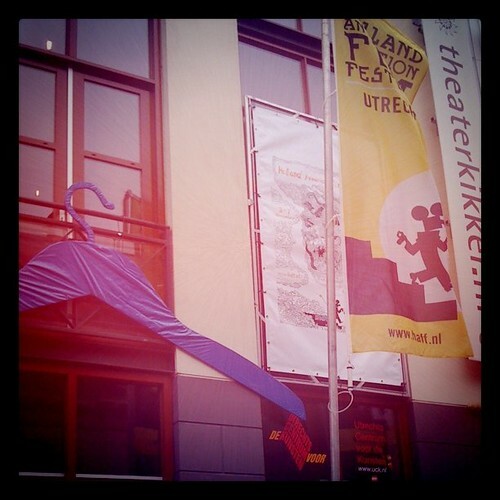 We have a monthly Cultural Sunday event here in Utrecht that changes themes each month. This month, the theme is dance. This month, the event is also taking place on a Monday, instead of Sunday. Must be due to the Pinksterdag holidays. If you like to dance, you really may want to come to town tomorrow if possible. 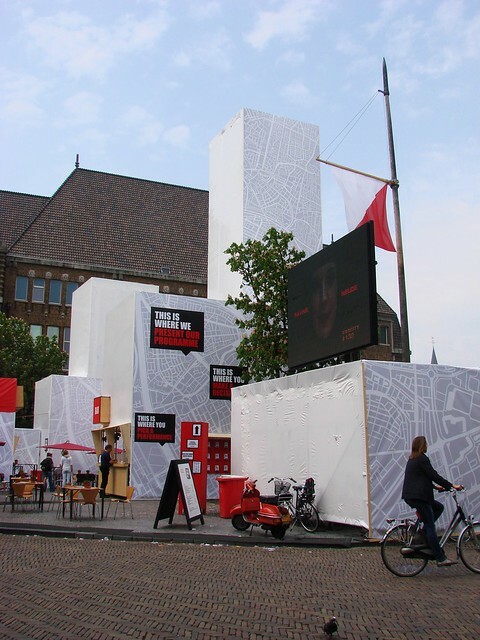 At 17:00, there’s going to be a big group dance at the Domplein, with participants — and that can be anyone — doing a choreographed dance. It’s kind of a fun idea. There’s even an instructional video so you can (try to) learn the choreography. I think I may try to talk G into going over with me tomorrow. I’m awful at learning choreography, but I still think this could be a fun thing to see! 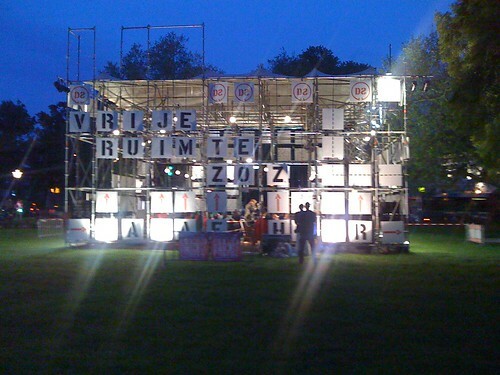 One of the great things about Utrecht is the range of cultural events going on around town. 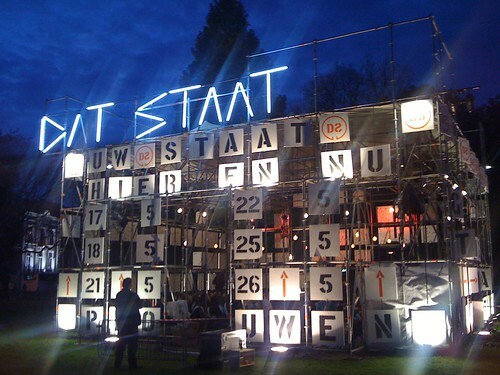 It’s not just standard events at the stadsschouwburg (city theater); it’s the monthly cultural Sunday events throughout town and the event that happened this weekend, the Café Theater Festival. From Friday through Sunday, at 20 cafés around town, short, half-hour plays were performed each night. We were at the Potdeksel on Friday, of course, and got to see Falstaff maakt een Odyssee, a humorous telling of the story of Odysseus. It was in Dutch, but I got the gist of a lot of it. It was also a humorous retelling as they made the most of a few simple props and odds and ends in the bar itself. There were only two cast members and they worked their way through the bar to play the different parts. The Sirens were represented amusingly by a bit of pop music from the bar’s stereo system. Scylla was a group of flexible tubes located at one end of the bar, while Charybdis was a burst of steam from the coffee machine, located at the other end of the bar, with the one cast member running back and forth to represent each one, sometimes running fast and furious! It was well done, at least from what I could understand, and I guess others agreed, since the play won the Publieksprijs (public prize). This annual festival is one of those smaller events that makes the city so great.